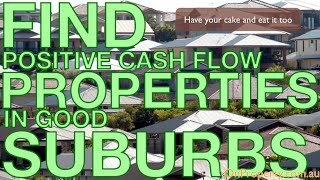 How Do You Find Positive Cash Flow Properties In Good Suburbs? How Do You Find Positive Cash Flow Properties In Good Suburbs? Well Anna thank you so much for your awesome question. It’s very difficult to find positive cash flow properties in your metropolitan areas. It is possible to find them in Sydney, Melbourne, Brisbane, Adelaide and Perth but you need to be creative. You need to either create a positive cash flow property or find something that you can change in some way to generate a positive cash flow. Properties with granny flats are a great example. They can be a similar price but if you rent out the house and the granny flats separately (with the proper approval) then you can generate a positive cash flow. The issue we have here is that Anna can find positive cash flow properties (which are easy to find in country towns or regional centers) but when she does the research into those areas the numbers don’t add up. If you are doing long-term investing then you want to invest in a suburb that’s going to grow because that’s going to increase the price and rental income of your property. I understand the situation. There are a lot of areas where you can find positive cash flow properties but they are areas you probably wouldn’t want to invest in. I actually almost bought a property on owner finance in a place called Bourke which is in north-western New South Wales. It was very cheap and a positive cash flow property but after learning about the town I found that it was a place I wouldn’t visit let alone buy and manage a property in. So what I would do in this situation is start by researching suburbs. Look at properties in particular suburbs with the intention to find out whether or not a suburb can deliver a positive cash flow. Also rather than looking into individual properties I would take a quick look at different areas. Then I would find a bunch of properties and use the Advanced Property Calculator (which is available to On Property Plus members) to see if the town could generate a positive cash flow property. After that I would then look at the areas closer and research them in detail to find out if they have the factors I’m looking for like good population growth and a low vacancy rate. If I was really interested in a particular area then I would start talking to real estate agents about the rental market in the area. So rather than focusing on an individual property try to find a whole bunch of suburbs that have positive cash flow properties in them and then research those suburbs. Once you find a suburb or two that has what you’re looking for then concentrate your focus on researching that area. I would learn what streets are good/bad, learn where the Housing Commission is in the area, talk to real estate agents and get familiar with the area. Just keep researching because if you find one positive cash flow property then there are likely going to be others. Good suburbs are out there with positive cash flow properties. Keep your head up Anna because you can find them but it’s just going to take a broad sweeping approach. So rather than picking a property from a listing and doing all the calculations just to find out the area stinks, start big. Start with the towns that suit your needs and research them. Once you know which towns are good then you can focus on specific properties and chances are you’ll find something. I hope that this helps you. If you have a question that you want answered simply send me an email to ryan@onproperty.com.au or go to onproperty.com.au/contact.